Hello, my name is Yudith Ho. I am a multimedia journalist interested in emerging markets, international trade and economic and cultural issues in Southeast Asia. I overuse the word "wonder." It gets most interesting at the end where Geron calculates the average investment per company in the last decade. Intel Capital invested $10.4 billion in 1,185 companies, which makes an average of $8.78 million per company. Year-to-date, it has invested $472 million in 72 companies, which makes an average of $6.6 million per company, and announced $40 million investments in 10 projects, which calculates to $4 million per company. Intel Capital’s case may be an evidence for a trend of venture capitalists opting for more smaller-sized and earlier-stage deals, as reported by research firm CB Insights. This is likely because starting an Internet company has become exponentially cheaper. Mark Suster from Both Sides of the Table has a neat chart on the fifth page of his slides, showing the figure drop by 99.9 percent to a mere $5,000 because of developments like open source models, cloud computing and developers using their own expertise to start a tech company. Venture capitalists may also be funding a larger number of companies in earlier stages and with smaller checks because they are afraid of missing out on the next Google or Facebook. For safeguarding, they sometimes ask entrepreneurs to sign a pro-rata contract, which gives them the option to purchase additional equity of the same proportion as they bought during the seed stage. For example, if a VC provides a seed funding for 20 percent equity, they may exercise their option to buy another 20% during the second round of capital raising if they think the company is doing well or let the small check evaporate if not. But some start-ups may fall into the trap of driving away future investors if they have too many pro-rata contracts that were not activated. It signals that the VCs that have poured seed funding into the company probably doesn’t think it is doing well, when the VCs may simply have too many start-ups to mind, considering they are signing more deals in more than two years. Venture Hacks has a lengthy and comprehensive discussion between Chris Dixon, Mark Suster and Naval Ravikant on the pros and cons of this method, from both the entrepreneur’s and investor’s side. I stumbled on a TED talk a few days ago and have since been hooked on many more (Oh hello assignments–give me a second). An old one stood out to me in the context of Occupy Wall Street. Here is an engrossing discussion of meritocracy and an attempt at shaping “A Kinder, Gentler Philosophy of Success” by Alain de Botton, who wrote the book on (not) enjoying your work. Whichever side you stand on, the speech is relevant and brings up many intriguing ways of rethinking the meaning of success. Oh, and do stay on after the applause. Smaller Wall Street bonuses? Robin Hood Tax? No drums? How about this: large banks like Citi, Morgan Stanley, JP Morgan and Bank of America reported shiny third-quarter earnings, but not so much from stellar performance as from booking profits on their own worsening credit. In other words, they aren’t doing as great as their earnings say. The banks are recording gains from debt valuation adjustments (DVA, also CVA). That means, say I have a mortgage and my credit score worsens because I’ve been demoted to freelance from full-time. The value of my mortgage decreases. And on the theory that I can repurchase that mortgage at a lower price, because of its worsening quality, I can (theoretically) make a profit. I can’t buy back my mortgage but banks can buy back their debts. Morgan Stanley bought back $2 billion of their own debt and earned $100 million. They also booked $3.4 billion in accounting gain from DVA, which makes up $1.12 of their reported $1.14 earnings per share. 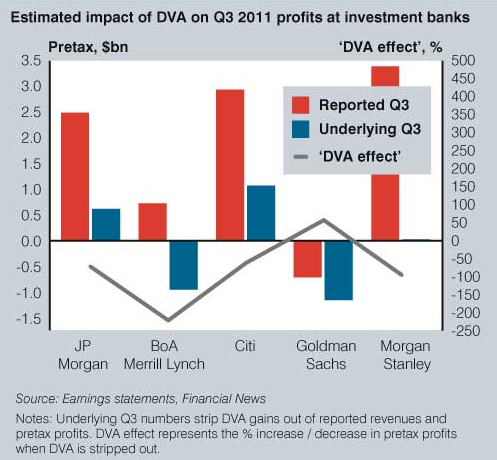 Citi and JP Morgan booked $1.9 billion in DVA gains while Bank of America recorded $1.7 billion. Goldman Sachs‘s $450 million gain from DVA is minuscule by comparison, but that’s because it hedged potential DVA gains to prevent wild swings in its earnings. Just what CEO of Morgan Stanley Steve Gorman means when he calls their third-quarter DVA a “bizarre accounting anomaly” and said it may swing the opposite way in the next quarter. The 99 percent may be happy to know that the big banks aren’t doing that much better than the rest of us, unless the accounting acrobatics provoke more drumming instead. I can’t wait until OWS protesters start to complain about this.